Frangible Ammo | Ammo & Bullet Mfg. Inc. Going to a shooting range can be an excellent recreational activity for most people. Members of the police force or military can also hone their skills with regular shooting practice. While you are training, you might notice that standard ammunition is not suitable for short-distance shooting. What you need is frangible ammo. A safer alternative to traditional lead bullets, frangible ammo can function excellently and prevent accidents during firing practice. If you plan to test your skills in the shooting range, then you should have a supply of this type of ammunition. Frangible ammo prevents any issues with ricochets. The most common and dangerous problem people encounter in a shooting range is a ricochet. When you use standard ammunition instead of frangible ammo, you are more likely to encounter a ricochet once the cartridge hits the target. With frangible ammo, this will never be an issue. Frangible ammo is designed to dissolve upon hitting a surface that is harder than it is. Once the frangible ammo makes an impact on a target, there will be no traces left of the cartridge that could bounce back and potentially harm people or properties. As a result, the shooter and the people within proximity remain safe. Using frangible ammo is beneficial for individuals who want to learn how to shoot. If you are interested in this ammunition, our team at Ammo and Bullet will be more than happy to tell you everything you need to know. Frangible ammo eliminates the possibility of lead exposure. One of the disadvantages of using traditional bullets is the lead emission that follows after each shot fired. Compared to using frangible ammo or bullets, firing standard ammunition can put people nearby at risk of lead poisoning. If you do not want to put yourself or others in danger, we suggest that you use frangible ammo for defense. Since the bullets do not contain lead, frangible ammo is ideal for those who are undergoing specialized or self-defense training. Using frangible ammo can also help protect our environment since there is no lead present that can pollute the air. You can also continue doing your shooting activities while keeping yourself safe when you use frangible ammo. For extra precaution, choose ammunition made by a reputable manufacturer. Frangible ammo is ideal for self-defense. Compared to traditional bullets, frangible ammo is better for self-defense. As such, it is also ideal for training. Getting used to the feeling of shooting with frangible ammo allows you to react fast and instinctively if you ever find yourself in a dreadful situation. Are you interested in self-defense training? You can start developing your defense shooting skills using frangible ammo produced by trusted manufacturers of ammunition. Ammo and Bullet is an ammunition manufacturer based in Maine that creates premium-grade bullets for the armed forces, law enforcement, and businesses. 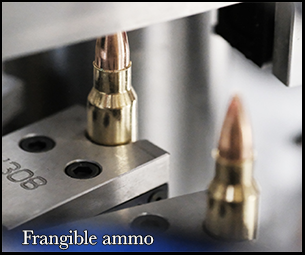 All of our products, including frangible ammo, are made using high-quality materials and state-of-the-art machinery. We create ammunition with these in mind: quality, safety, and performance. Do you plan on purchasing frangible ammo? Let our team at Ammo and Bullet be of assistance. If you want to learn more about our ammunition, feel free to get in touch with us today!